I’ve been having a great time in Texas, New Mexico, and Arizona this month. Since leaving on November 3, I’ve added 26 species to my Conservation Big Year list and visited some of my favorite, time-honored birding spots. But November 19, 2013, may have been the best day of all down here. I added three new species, but I’ve seen that many or more several days this year. What made this particular day so special was that I spent it birding my favorite way—walking by myself, moseying along and paying attention to whatever caught my eyes or ears, with no expectations or hopes at all. 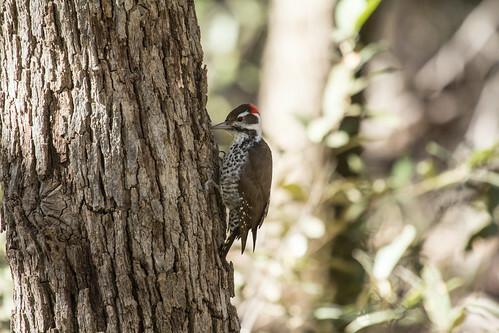 Doing a “big year,” or anytime a birder spends a limited time in a new area, the goal is to see as many species as possible. That promotes a frenetic pace and mindset. 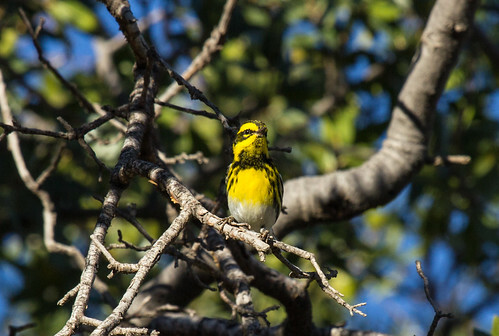 In heavily birded areas like the famous Madera Canyon, birders passing one another tell each other what they’ve seen. 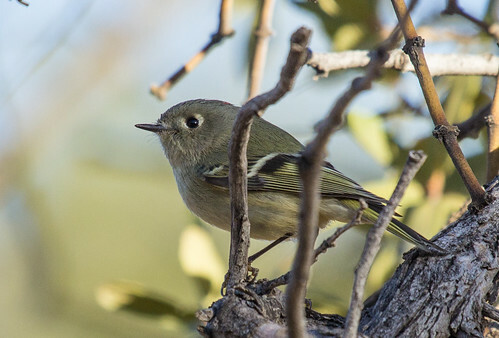 When you hear about an Olive Warbler or Arizona Woodpecker about an eighth of a mile down the road, you forget all about the little band of Bridled Titmice you’ve been enjoying to rush off while the potential new bird is still around. This can be exciting and fun, and I’ve done my share of that kind of birding this year. I end those days with a nice big species list, but somehow don’t have the same deep pleasure and happy sense of contentment that I do after a day of moseying, finding my own birds and having long, pleasant encounters with them. I seldom unearth heart-stopping rarities on my own, but I get a better feel for what birds are in an area and how they spend their day. My approach is far more laid-back than what I’d need to be doing for a competitive Big Year. Neil Hayward, a Massachusetts birder doing a real 2013 Big Year, is at 731 right now, after spending 175 nights away from home, flying more than 160,000 miles on 152 flights through 54 airports, driving 49,140 miles, and spending 137½ hours at sea. I’m only at 569, after being away from home 138 nights so far. I’ve driven close to 30,000 miles, but have flown an order of magnitude fewer miles than Hayward to only 4 airports—7 if you count stopovers and Duluth—and spent only about 28 hours on the ocean. 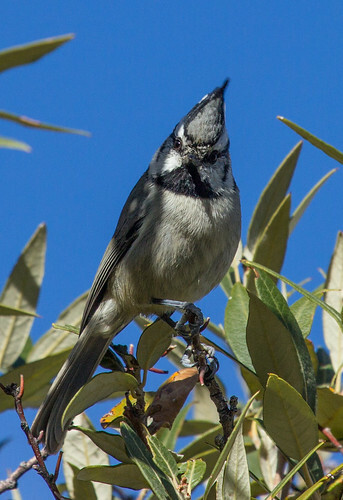 I don’t have the money to do a world-class, competitive Big Year, but I also lack the drive and the ambition—I’m sort of the Mr. Rogers of the birding world. I do want to get to 600—that number has had a romantic appeal as a birding milestone since I started birding and read Peterson’s A Bird Watcher’s Anthology, but for me, the fun of birding is only indirectly about the number of species I see. 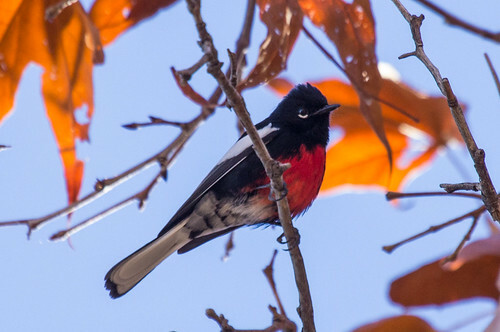 My biggest thrills have come on days exactly like the 19th, when I moseyed along and immersed myself in the present—enjoying each bird and moment without the inner restlessness that comes from anticipating better birds down the road or at the next destination. Ironically, November 19th turns out to be the day that I finally saw my personal Most Wanted Bird of North America—the Montezuma Quail. And it all came about because of my own stupidity and bad luck in not noticing before I left on this trip that my drivers license was about to expire. Trying to balance my birding experiences this year has been tricky. The blank spots on my checklist have a subtle way of making me want to see those birds more than to take pleasure in species I’ve already seen. 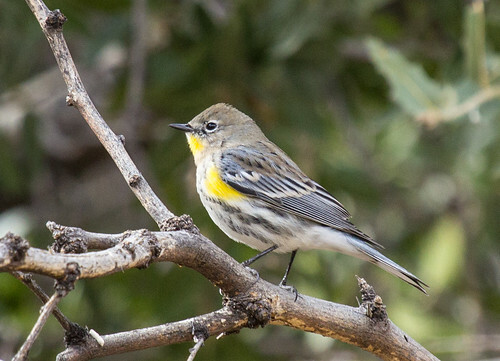 I was planning on spending November 18th and 19th at the place I most wanted to go to in Southeastern Arizona—Fort Huachuca, a military installation that encompasses some of the most birdy canyons in the state. 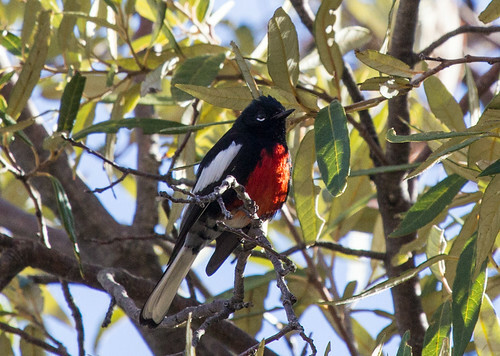 For months there’s been an exceptionally rare Sinaloa Wren there, and it’s where people get the most sightings of Spotted Owls and Elegant Trogons. But when I got to the entrance, the guard on duty noticed that my drivers license had expired a week before, and she simply could not let me pass. I was distressed, to say the least, but there wasn’t anything I could do except to call the Minnesota DMV and see if I could get a license from a distance. While I wait in Sierra Vista for their application to arrive in the mail, I’ve had to come up with an alternative plan. Highway 92 out of Sierra Vista intersects with a few roads that lead directly into other canyons in the Huachuca Mountains. I decided, since I couldn’t get to the places I’d wanted and couldn’t leave Sierra Vista until I’d gotten my license renewal form in the mail at my motel, that I might as well explore some of the lesser-known canyons. So on the 19th I drove to Carr Canyon, arriving with sunrise. November is a quiet month—few birds sing and I was in a subdued mood to match—but the canyon is astonishingly beautiful. 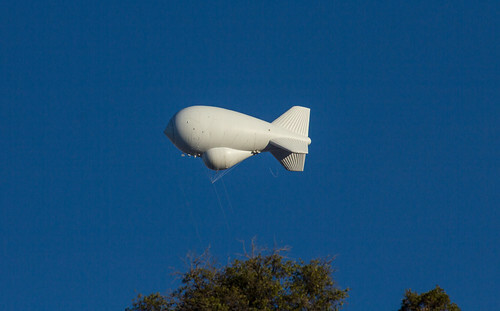 It was a little hard to ignore the surveillance blimp always in view high from above the mountain range—it gave me a creepy feeling that I was being observed by an entity far larger and more impersonal than I, and called to mind that creepy big white ball thing on the old TV show, The Prisoner. But I figured that’s probably how birds feel when they see some giant being with binoculars and a huge camera staring at them, and it gave me a certain empathy. I parked near the entrance to the Coronado National Forest and started walking, up and up. The road is fairly steep and very narrow at the switchbacks as you get near the end of the road, but it was well graded and an easy stroll. 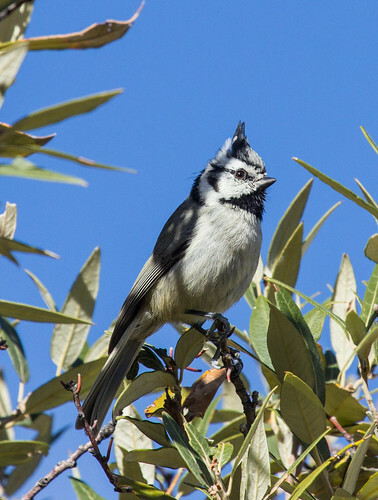 Some of the bird books recommend driving up, making a few stops along the way, but the rhythm and pace of walking stir my soul, and I definitely notice more birds on foot than in my car. 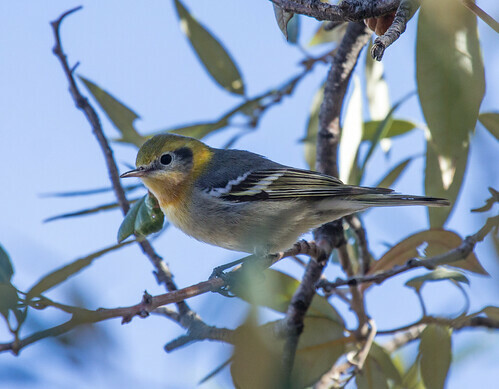 I came upon flocks of Bridled Titmice, Painted Redstarts, and Townsend’s Warblers along with the ubiquitous Yellow-rumped Warblers. These were all species I’d seen before, but rather than hurry on toward something more exciting up the road, I took the time to actually look at the individual birds, picking out a Black-throated Gray Warbler (who carefully stayed out of the reach of my camera), several Hutton’s Vireos, dozens of Ruby-crowned Kinglets, and more. 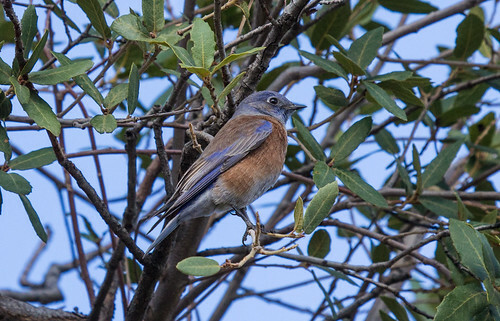 I sorted through flocks of Eastern and Western Bluebirds. It was theoretically possible I’d catch sight of an Aztec Thrush among them—they’ve been seen in some winters at Carr Canyon—but I wasn’t even wishing for that, just enjoying these lovely birds in a spectacular setting. I heard an unfamiliar chip and looked up to see two Olive Warblers—new for my year. They’re far less common in winter than in summer, and so I was not really expecting to find them at all. I got lots of photos and learned their pretty chip. 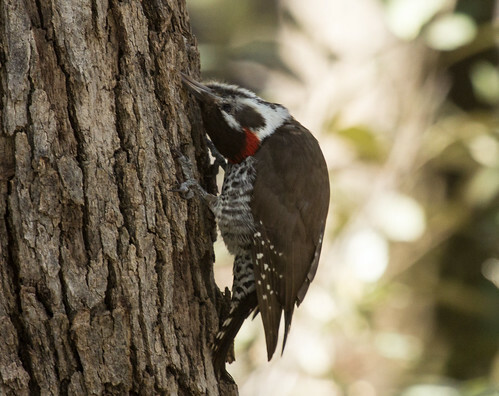 When I heard some soft nearby pecking, I searched every tree trunk until I came upon an Arizona Woodpecker—a declining species and one I knew I’d need good luck to see at all this year. Again, I got to stop and watch him, a gorgeous male, until he worked his way deeper into the woods. The lighting was poor in the shadows of the canyon and woods, but I could take my time getting photos. 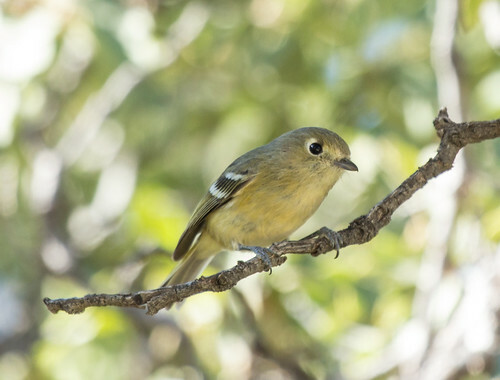 For five miles I moseyed up, enjoying Bridled Titmice and Bewick’s Wrens and Yellow-eyed Juncos and just about every form of Dark-eyed Juncos. I turned around at noon, but by then bird activity had dwindled and I saw far fewer birds. As I was getting close to where my car was parked, surrounded by golden grasses and deep green oaks, I heard a soft rustling and looked down to see the back of a Montezuma Quail running through the tall grass. It was just a quick glimpse, but a perfect one. I’ve spent lots of time searching for Montezuma Quail before, without luck, and became fixated on them as my Most Wanted Bird of North America. On the day I was stuck in an area only because my drivers license had expired and I was just moseying around with no expectations at all—there was my lifer! I was still glowing with pleasure when I got into my car and started back to my motel. And suddenly, a bit down the road in the same golden habitat, was a whole flock of quail. I instantly stopped, but they’re skittish birds and hurried into the grasses before I could grab my camera. I slowly walked toward where they’d been, but they felt uncomfortable under my surveillance and all flushed. 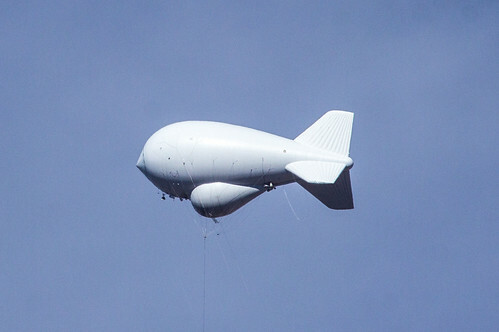 I felt bad, especially when I looked up at the surveillance blimp, knowing how uncomfortable it feels to be spied upon by anonymous strangers. I didn’t mind not getting a photo—quail deserve their privacy as much as we Americans used to think we did, and I went back to the motel as the sun retreated in the west, satisfied at my most unexpectedly bountiful and beautiful day. This entry was posted in Uncategorized on November 21, 2013 by Laura Erickson.